We’re in deep now, folks. 4 progs into the current refresh, characters are getting fleshed out, and stories are beginning to unfold. 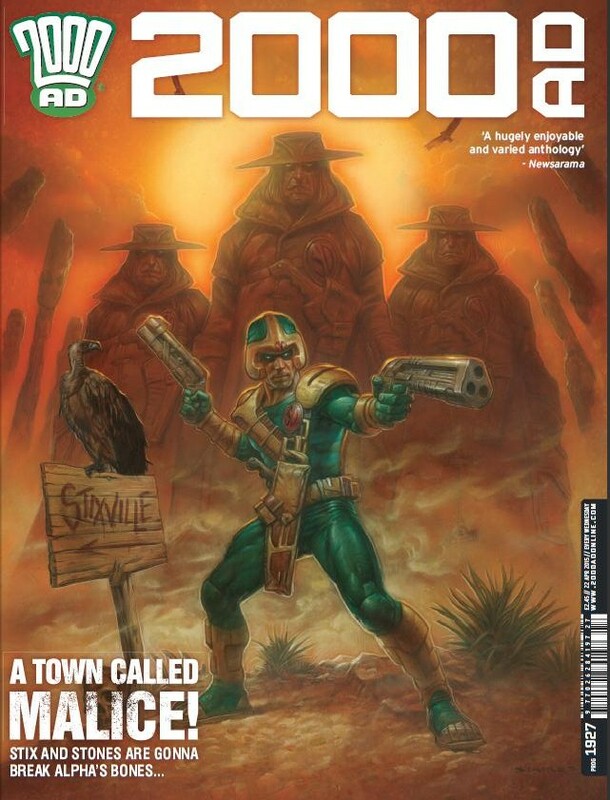 So is 2000AD able to sustain its high standard, or is it just stuck in a holding pattern? You need a good romp in 2000AD, it’s in the rules, I swear. But this is no daft caper, as the title implies: instead, it’s a slice of retro heaven, like all the 80s Cold War progs we knew and loved. What works particularly effectively is here the story gathers pace, which is not only good for this but as part of the prog as a whole – as an editorial decision, it balances out the stories in the issue overall. With Orlok getting his man, and dealing with the competition, we find ourselves again rooting for one of the Megaverse’s ultimate villains, and ending on a wry smile doesn’t hurt either. It’s really unusual to have another more cerebral issue of Slaine, one that’s heavier on the dialogue (though still absolutely lush on the artwork) and taking the time to explore the character in depth. It’s a bold move from Mills, whose gritty, grinding, pacey narrative style has become part of his signature from classic ABC warriors to the more recent Savage. This could almost be meandering, but instead it serves to embed the character’s uncertainties, which acts as an effective counterpoint to the splattering ultra-violence that we expect (and hope for), ratcheting up our anticipation. It’s a great way into the broader story – as long as it delivers next Prog, which it surely will. A pet hate of mine is writers who try to express character boredom through boring their reader (as seen in Harry Potter Goes Deathly Camping, for instance). It’s a truly gifted writer who can express frustration through the mundane, and my admiration for Abnett has only increased in the course of this. By separating the story into mini-narratives on a prog-by-prog basis, it also serves to emphasise the abject, pointless wait that the characters are faced. Coupled with art that manages to make shower scenes appropriately mundane, rather than titillating, together Abnett and Harrison make the apocalypse that’s approaching the characters all the more awful as they are so utterly powerless to affect their situation. It could be dire – instead, it’s funny, infuriating and compelling. Again, this is about pacing. We’ve had a lot of laughs in what is ultimately a very dark chapter in the life of Johnny Alpha, as you’d expect from the dream team. However, they know when to turn it around: again, not only to the benefit of this story, but for the Prog as a whole. Like all the best mutie stories, this has a strong Old West vibe, and feels as if we’ve entered the next act of a classic Western, with lone gunman Johnny entering the frightened inbred town for an unwinnable showdown. It’s an absolutely glorious, technicolour romp that’ll make you reach for the sky. 2000AD just keeps getting better. With Free Comic Book day just around the corner, do yourself a favour and get stuck in.